The Providence-based organization advocates for public art. Yarrow Thorne’s public art organization, the Avenue Concept, is named after the idea of an avenue, a space layered with activity and one that creates connections for people in their daily lives. Three years ago, it was one of only twenty emerging arts organizations nationwide to win three years of seed grant funding from the Robert Rauschenberg Foundation. While a student at RISD, Thorne helped develop the college’s first public art program granting students support to work in large public formats. 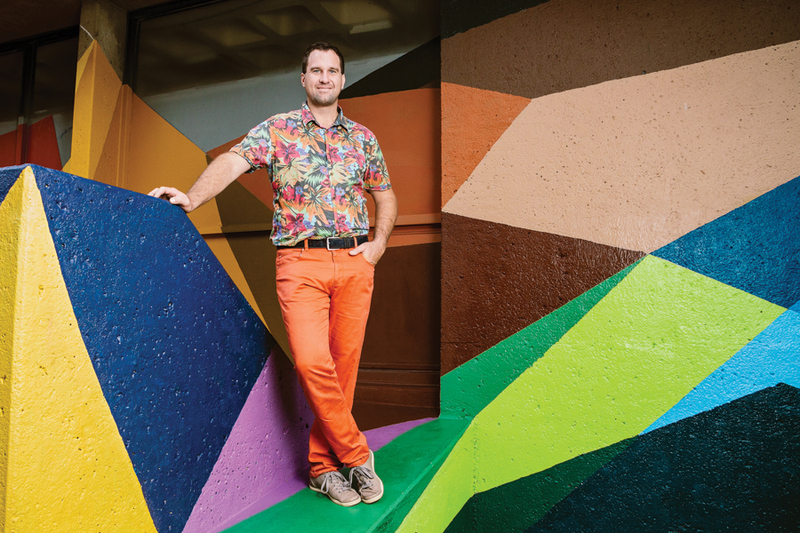 The seed money enabled him to experiment with a citywide vision for public art policy, and establish a fund to sustain it through the Rhode Island Foundation with the support of local residents. When Mayor Jorge O. Elorza took office pledging to create a large-scale, South By Southwest-style cultural event, Thorne saw an opportunity. This summer, the Avenue Concept worked in partnership with the Providence International Arts Festival and fifty local artists and designers to create multi-story murals by internationally renowned street artists Bezt and Natalia Rak (which still bookend a parking lot downtown), a temporary installation by Providence’s own TapeArt and an interactive skate and sculpture park outside the Dean Hotel. It also awarded mini-grants to local artists to create a “cultural corridor” along Washington Street. The arts organization turned the drab courtyard between Providence’s Classical and Central High Schools into another vibrant cultural corridor, the first such experiment at a public school in Rhode Island. It has also worked with the City of Providence and the planning department to construct permanent infrastructure for public art downtown, in the form of five concrete pads on which to erect rotating sculptures. By December, all five privately funded sculptures will be installed, and in the spring, farmers and gardeners will maintain the city’s first landscaped parcels featuring public art.